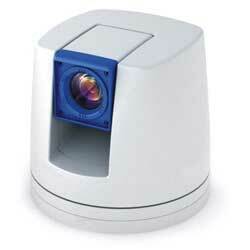 A Pan tilt zoom Camera (PTZ Camera) is a surveillance camera with remote directional and zoom control. 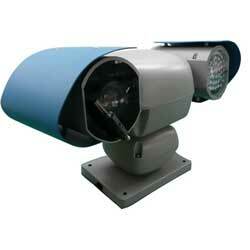 They are often recommended in situations where a large area must be covered, with a minimum quantity of cameras. Not only do PTZ cameras pan left/right, and tilt up/down, but some PTZ dome cameras are capable of fully rotating 360 degrees. Accessories such as motion detectors and panic buttons can also be configured to your camera so that when one of these is triggered the PTZ camera automatically moves to look at the predetermined position. 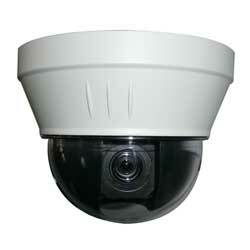 The G25 series is a high performance mini (&152mm) PTZ dome camera. Equipped with 10x optical zoom module and auto-focus, it provides true high resolution with 530 TV lines, and fast PTZ ability. The dip switch-less OSD setting design enable user friendly installation. It is also available with Day&night ability, and a ultra high sensitivity night view (0.0004 lux). Full HD camera 720p, 1080i, 16/9 format, 2Mega Pixels - 10x Optical zoom HD lens- True day & night with ICR- Max. pan speed: 160&deg;/s; Max. Tilt speed: 120&deg;/s- Support up to 255 presets- Communications:RS232/RS422, Infrared remote-controlling- Support terminals of video conference camera from other manufacturers - Can be mounted up-side-down. This special designed PTZ is for vehicle application, which has High-strength casting cover, anti-shocking, and corrosion-proof. The power design is able to resist the impact from vehicle"s start-up, emergency brake and engine died. It meet IP66 standard and works from -40° to + 60° environmental temperature. Rating impact load 3.4g accelerate. Park action, it can auto-call presets, start-up tour, pattern or scan after dome idle for a period of time. The 216x ( 18x optical and 12x digital ) zoom camera features 470TVL high resolution and 0.01 lux with ICR ON in night mode. The G70M series some of the latest feature of the industry including motion-tracking with video analysis which is able to target moving object, and metal inner construction which make the PTZ runs more steady. The 18x PTZ also features powerful zoom capability with 216X totally zoom (18X optical zoom with 12X digital magnifier), and images with a high resolution (470 TV lines) can be obtained using a newly developed DSP for improved picture quality. -Quick clip-on core unit -Temperature-controlled by heater and blower. The G50 series represents a new concept of outdoor video surveillance: the 180° Tilt / 360° Pan range with active lightning (available with IR or visible headlight) keeps every corner in sight, at day and night. The high-speed intelligent PTZ ability enables fast reaction and ergonomic surveillance control, supported with programmable cruising function. It is also equipped with latest image enhancement technology, such as true high-resolution and IR-cut Removable filter. 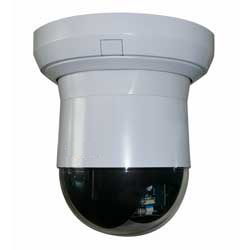 The EX-view HADTM CCD features 380,000 (NTSC) or 440,000 (PAL) effective picture elements and high-sensitivity shooting. The minimum illumination required is 0.7 lux (1/60 s (NTSC), 1/50 s (PAL), ICROFF). For low light applications, a removable infrared (IR) cut filter provides effective viewing in lighting conditions as low as 0.01 lux in black and white mode. The 18x PTZ also features powerful zoom capability with 216X totally zoom (18X optical zoom with 12X digital magnifier), and images with a high resolution (470 TV lines). 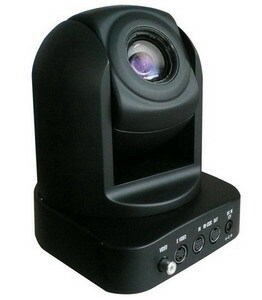 Adopts newly developed DSP for improved picture quality when using the digital zoom or the slow shutter. 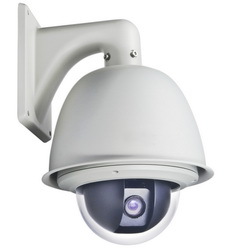 PTZ-Security Cameras You Can Count On!